Dysfunctional expression of T-bet, a transcription factor that is critical for IFN-γ production, has been implicated in the development of asthma. To investigate in detail the mechanisms responsible for exacerbated disease in the absence of T-bet expression, BALB/c wild-type (WT) and T-bet−/− mice were used in a murine model of OVA-induced allergic lung inflammation. Following OVA challenge, T-bet−/− mice displayed increased histological inflammation in the lungs as well as greater thickening of the bronchiole linings, increased numbers of eosinophils and neutrophils in the lung, and enhanced airway hyperresponsiveness, compared with WT mice. However, the production of Th2 cytokines in T-bet−/− mice did not appear to be significantly greater than in WT mice. Interestingly, a marked increase in the levels of the proinflammatory cytokine IL-17 was observed in T-bet−/− mice. Neutralization of pulmonary IL-17 in T-bet−/− mice by anti-IL-17 mAb treatment during OVA challenge resulted in decreased levels of neutrophilic infiltration into the airways and decreased airway inflammation, essentially reversing the development of allergic asthma development. These findings indicate that IL-17 is a key mediator of airway inflammation in the absence of T-bet. The results of this study suggest a possible target for therapeutic intervention of human asthma. Allergic asthma, the most common form of asthma, is a chronic inflammatory disorder of the lung in which CD4 Th cells play a key role. Experimental evidence indicates that there is a predominance of CD4 Th2 immune responses during the asthmatic disease process (1). Th2 cells are characterized by the production of IL-4, IL-5, and IL-13 (2), which, in response to inhaled allergens, results in the classic phenotypic traits of allergic asthma, specifically, eosinophilic infiltration, bronchial hyperresponsiveness, mucus hypersecretion, and allergen-specific IgE production (3, 4). In contrast, expression of IFN-γ has been shown to prevent development of allergen-induced airway inflammation (5, 6). IFN-γ is mainly produced by CD4 Th1 cells and suppresses Th2 responses. Therefore, allergic airway inflammation appears to be regulated by a sensitive balance between an overactive Th2 response and an inhibitory Th1 response. The T-box transcription factor, T-bet, is crucial for Th1 cell differentiation (7). Expression of T-bet induces IFN-γ production and suppresses Th2-associated transcription factors (8). In agreement with its key regulatory role in immune responses, dysfunctional expression of T-bet has been implicated in the development of allergic asthma (9). Indeed, reduced expression of T-bet in pulmonary T cells from asthmatic patients has been observed compared with T cells from nonasthmatic patients (9). In addition, mice that are genetically deficient in T-bet expression have been found to spontaneously exhibit airway hyperresponsiveness, as well as increased production of pulmonary Th2 cytokines and enhanced eosinophilic infiltration into the lung. These changes mimic both acute and chronic human asthma (9). Recently, the role of T-bet in asthma has been further underscored by reports that polymorphisms of the T-bet gene are associated with allergic asthma and airway hyperresponsiveness (10, 11). Thus, T-bet expression appears to be a critical genetic factor in allergic asthma. However, the precise role of T-bet in the regulation of allergen-induced airway inflammation remains unknown. Recent evidence has also suggested a role for the proinflammatory cytokine IL-17, in the pathogenesis of airway disease, including allergic asthma. IL-17 is primarily secreted by CD4 Th cells and aids in neutrophil influx into peripheral sites partially through the induction of G-CSF and other chemokines (12). Not only has IL-17 expression been found to be up-regulated in the airways of mice and humans following allergen-induced airway inflammation (13, 14, 15, 16), but IL-17 has also been found to induce pulmonary inflammation (17). In addition, there appears to be strong evidence that in response to IL-17 production, there is a neutrophilic influx into the lung, which contributes to pulmonary diseases, including asthma (18, 19). Similar studies have suggested that IL-17 is crucial for allergen-specific bronchial hyperresponsiveness (20). Thus, accumulating evidence indicates that IL-17 has a key role in allergic asthma. Interestingly, T-bet-deficient cell cultures secrete higher levels of IL-17 than wild-type (WT)3 cultures in response to TCR and cytokine stimulation, suggesting that T-bet is a critical negative regulator of Th17 cells (21). In addition, it has been shown that Th17 cells can develop in vitro in the absence of T-bet and STAT1 (22). Indeed, T-bet appears to be an inhibitory factor for IL-17 production, and the loss of T-bet suggests a possible default pathway leading to IL-17 production. However, the interplay between the regulatory role of T-bet and the production of IL-17 following allergen-specific provocation remains to be investigated. In this study, we have now used the established murine model of OVA-induced lung inflammation to test the hypothesis that in the absence of T-bet regulation, an enhanced proinflammatory IL-17 response would lead to increased pulmonary inflammation. We further hypothesized that neutralization of IL-17 in T-bet−/− mice would prevent development of asthmatic symptoms. BALB/c WT mice were obtained from Charles River Laboratories through a contract with the National Cancer Institute. BALB/c T-bet−/− mice were obtained from The Jackson Laboratory. IL-17R−/− mice were provided by Amgen and backcrossed seven generations onto the BALB/c background. All mice were housed in microisolator cages under pathogen-free conditions at Albany Medical College, and the Institutional Animal Care and Use Committee approved all procedures concerning the use of these mice. Allergic lung inflammation was induced, as previously described (23). Mice (5–7 wk of age) were immunized i.p. twice with 10 μg of OVA (Sigma-Aldrich) in 4 mg of alum (Reheis) at weekly intervals for 2 wk. One week following second immunization, the sensitized mice were lightly anesthetized and challenged intranasally (i.n.) with 100 μg of OVA in saline once daily for 5 days. Controls included naive mice and mice that were OVA sensitized, but challenged with only saline. Twenty-four hours after the final inoculation of OVA, the mice were sacrificed. Bronchoalveolar lavage (BAL) fluids were collected with a microsyringe fitted with a cannula that was gently inserted into the trachea, and the lungs were lavaged three times with 1 ml of PBS. The amount of recovered lavage fluid was 750–900 μl per mouse ± 5% variability among groups. The BAL fluids were centrifuged at 300 × g for 10 min at 4°C, and the cell-free lavage fluids were stored at −80°C until analysis. Numbers of viable cells in BAL were determined by trypan blue exclusion, and the cells were mounted on slides for cytospin analysis by centrifugation at 110 × g for 5 min at room temperature. In addition, portions of lung tissues were snap frozen in liquid nitrogen and stored at −80°C for cytokine analysis. Other lung tissue samples were fixed in formalin (Fisher Scientific) for histological analysis. After collection of BAL fluids, lung tissues were fixed overnight in 5% buffered formalin, dehydrated, and embedded in paraffin blocks (Richard Allan Scientific). The blocks were sectioned (5 μm thickness) and stained with H&E (Fisher Scientific). Slides were blinded, and the peribronchial regions, six to eight per mouse, were scored at ×200 magnification for inflammatory cellular infiltrate severity around airways, as previously described (24) (0, normal; 1, <3 cells diameter thick; 2, 3–10 cells thick; 3, >10 cells thick). The presence of inflammatory cells was assessed using standard light microscopy; inflammation manifested as infiltrates in the perivascular and peribronchiolar regions of the lung. Inflammatory cells isolated from BAL fluids were evaluated using a commercially available modified Wright-Giemsa stain (HEMA 3; Biochemical Sciences). Cytospins were stained according to the manufacturer’s instructions and examined under oil-immersion light microscopy. Protein levels of IL-4, IL-5, IL-13, and IFN-γ in BAL samples and lung homogenates were determined by cytometric bead array (CBA) analysis using a BD FACSArray. Protein levels of homogenized lung tissues were normalized to total lung tissue protein to determine cytokine levels in different groups of mice. The following were used to quantitate other cytokine protein levels: IL-17, DuoSet ELISA (R&D Systems); IL-23, Elisa Ready-Set-Go! (eBioscience); and IL-25, ElisaMax (BioLegend), per the manufacturer’s instructions. Total RNA was prepared from lung homogenates with TRIzol reagent (Invitrogen). cDNA was synthesized with superscript reverse transcriptase and oligo(dT) primers (Invitrogen). Gene expression was examined using a Bio-Rad iCycler Optical System and an iQ SYBR Green real-time PCR kit (Bio-Rad). The ΔΔCt method was used to normalize transcript to GAPDH and to calculate expression relative to untreated mice. Ct values were validated with different concentrations of RNA, and the number of fold inductions remained constant. The primers for IL-17A and retinoic acid-related orphan receptor (ROR) γt were previously described (25). Bronchial responsiveness to aerosolized methacholine (Mch) was measured 24 h following final OVA challenge, as previously described, using anesthetized, tracheostomized, paralyzed mice connected to a computer-controlled small-animal mechanical ventilator (flexiVent; SCIREQ). Forced oscillation measurements of airway resistance, tissue damping, and tissue elastance were obtained in response to increasing doses of Mch by fitting the constant phase model to the impedance data (26, 27, 28). Single-cell suspensions were obtained from the lungs of T-bet+/+ and T-bet−/− mice by collagenase digestion (2.5 mg/ml collagenase D, 0.25 mg/ml DNase I, and 1 mM MgCl2; Roche) for 1 h at 37°C, followed by passage through a nylon mesh. The cells were first incubated with 2.4G2 mAb to mouse FcγRII/RIII for 20 min and then incubated with PE rat anti-mouse IL-17 mAb (BD Pharmingen) or rabbit anti-mouse IL-23p19 Ab (Abcam) at 4°C for 30 min. Cells incubated with anti-IL-23p19 were washed and incubated with secondary PE-conjugated anti-rabbit IgG (Jackson ImmunoResearch Laboratories). Abs were titrated before use to determine specificity and optimal staining concentrations. Stained cells were detected with a FACSCanto flow cytometer and analyzed using FACSDiva (BD Biosciences) software. The lymphocyte population was gated based on forward and side scatter; 10,000 events per gate per sample were collected; and the data were reported as the percentage of cells within the lymphocyte gate. To neutralize pulmonary IL-17, rat anti-murine IL-17A mAb (Amgen) or control rat IgG (Jackson ImmunoResearch Laboratories) was inoculated both i.n. at a dose of 5 μg on days 1 and 2 of OVA challenge phases, as well as i.p. at a dose of 50 μg on days 1, 3, and 5 of OVA challenge. Statistical comparisons between mice were performed using two-tailed Student’s t test or ANOVA for multiple groups of mice with a Tukey multiple comparison posttest (GraphPad InStat 3). Values of p < 0.05 were considered to be statistically significant. To assess development of Ag-induced allergic airway inflammation in the absence of T-bet regulation, a murine model of allergic lung inflammation was used. BALB/c T-bet+/+ and T-bet−/− mice were sensitized by i.p. injection of OVA in alum and then challenged i.n. for 5 consecutive days with soluble OVA. Following challenge, lung tissues and BAL fluids were obtained for histological and cytokine analyses. Histological examination showed that Ag-induced inflammation was apparent in the peribronchial and perivascular areas of the lung following OVA challenge, and the extent of inflammation was much greater in T-bet−/− mice compared with T-bet+/+ mice (supplementary Fig. 1A).4 No pulmonary inflammation was seen in either naive or Ag-sensitized and saline-only-challenged T-bet−/− and T-bet+/+ mice (supplementary Fig. 1A and data not shown). 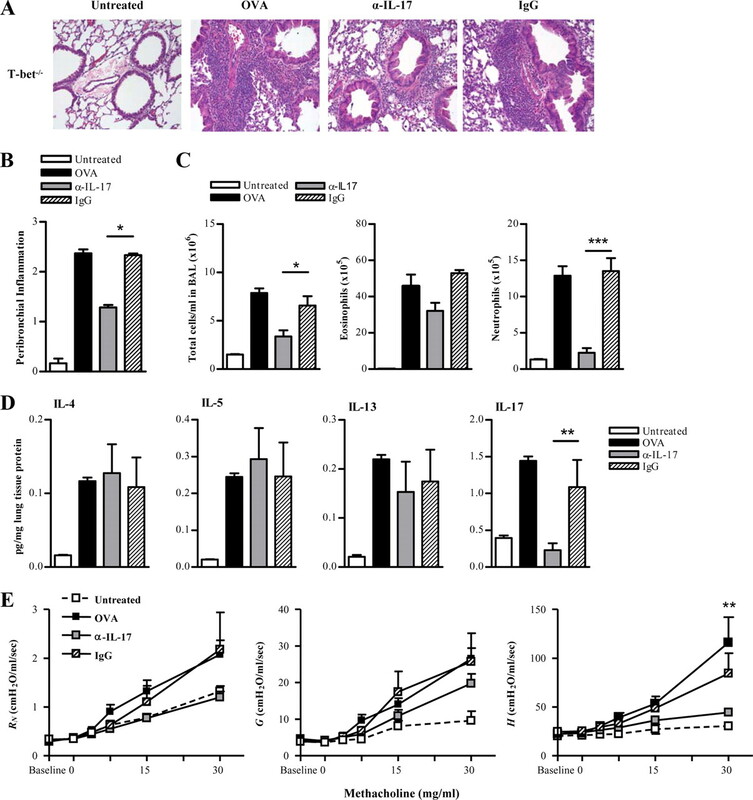 In addition to histological inflammation, it was found that T-bet−/− mice challenged with OVA developed a significantly increased pulmonary tissue resistance (G) and tissue elastance (H) to aerosolized Mch compared with T-bet+/+ mice (Fig. 1⇓, B and C). There was no significant effect on airway resistance (RN) in T-bet−/− mice compared with T-bet+/+ mice following OVA challenge. As expected, enhanced airway inflammation correlated with increased infiltration of inflammatory granulocytic cells into the airways. Expression of granulocytes was increased in both T-bet−/− and T-bet+/+ mice following OVA challenge, and levels of both eosinophils and neutrophils were greater in T-bet−/− mice compared with T-bet+/+ animals (supplementary Fig. 1B). Numbers of granulocytes did not differ among naive animals or animals that were OVA sensitized and challenged with saline (data not shown). Taken together, the results show that BALB/c T-bet−/− mice exhibit more severe OVA-induced allergic lung inflammation compared with T-bet+/+ counterparts. OVA-induced airway hyperresponsiveness is enhanced in T-bet−/− mice. Five- to 7-wk-old BALB/c T-bet+/+ and T-bet−/− mice were sensitized to OVA and challenged i.n. for 5 consecutive days. After challenge, airway function was assessed with forced oscillations using the constant phase model for lung mechanics. Newtonian resistance (RN) (A), tissue damping (G) (B), and tissue elastance (H) (C) were obtained in response to increasing doses of Mch in naive and OVA-sensitized and OVA-challenged T-bet+/+ and T-bet−/− mice. The data are shown as means ± SEM; six mice/group; ∗∗∗, p < 0.001. To investigate whether the absence of T-bet regulation leads to a dominant Th2 response following OVA challenge, cytokine expression in lung homogenates was analyzed. As expected, the lungs of T-bet+/+ animals showed increased levels of Th2-like cytokines, namely, IL-4, IL-5, and IL-13, following a 5-day OVA inhalation challenge (Fig. 2⇓). However, these cytokines were not elevated in T-bet−/− mice. In fact, the cytokine levels appeared to be lower in the lungs of T-bet−/− mice compared with T-bet+/+ mice, with the exception of increases in IL-13. Cytokine levels were also measured in BAL fluids, and the pattern of cytokine expression remained consistent (data not shown). Intracellular cytokine staining for IL-4 expression confirmed a deficiency of IL-4 expression in T-bet−/− mice (data not shown). Thus, there is a paucity of Th2 cytokine production following specific Ag challenge of T-bet−/− mice, implying that additional factors are responsible for the enhanced Ag-induced airway inflammation observed in these mice. Levels of Th2 cytokines in T-bet−/− compared with T-bet+/+ mice. Lung cytokine levels following allergic lung inflammation induction. Twenty-four hours after a 5-day i.n. OVA challenge, lung tissues were collected from T-bet+/+ and T-bet−/− mice. Protein levels were normalized to total lung tissue protein, and cytokine levels were measured by murine CBA. The data represent means ± SEM; eight mice/group; ∗∗∗, p < 0.001. IL-17 has been implicated in airway granulocyte recruitment (29). To determine whether IL-17 was produced during allergic lung inflammation in T-bet−/− mice, lung homogenates from OVA-sensitized and -challenged animals were analyzed. T-bet+/+ animals demonstrated an increase in pulmonary IL-17 levels, but interestingly, IL-17 levels were even more dramatically increased in T-bet−/− animals following OVA-induced allergic lung inflammation (Fig. 3⇓A). There were no detectable levels of IL-17 in the BAL fluids obtained from these mice. IL-17A transcripts were also significantly increased in T-bet−/− mice following OVA sensitization and challenge (Fig. 3⇓B). Similar patterns were observed for RORγt expression, a key regulator of IL-17A transcription (Fig. 3⇓B). RORα expression was also measured, and there appeared to be no significant difference between T-bet+/+ and T-bet−/− animals (Fig. 3⇓B). Intracellular cytokine staining of lung lymphocytes also demonstrated an increase in IL-17 production in T-bet−/− mice (Fig. 3⇓C). Serum IL-17 levels were low in all mice (data not shown), suggesting that IL-17 expression is locally amplified and particularly enhanced in T-bet-deficient lungs following allergen challenge. Many of the IL-17-expressing cells isolated from the lungs were found to be CD4+ (supplementary Fig. 2). In both the naive and OVA-challenged groups, little, if any, CD8+IL-17+ cells were found (data not shown), suggesting a major role for Th17 cells in response to inhaled allergen. Furthermore, IL-23, a critical cytokine for IL-17 production, was detectable in the lungs of OVA-sensitized and -challenged mice (Fig. 3⇓D). The levels of IL-23 were increased in T-bet+/+ animals following OVA challenge, but were increased to an even greater extent in T-bet−/− animals. In addition, 13.5 ± 1.4% of lung lymphocytes isolated from T-bet−/− animals were IL-23+ compared with 10.1 ± 0.7% IL-23+ lymphocytes in T-bet+/+ lungs. Also, there was a significant increase in IL-23R expression in T-bet−/− lungs (39.2 ± 13.8 relative expression) compared with T-bet+/+ lungs (16.1 ± 2.2 relative expression) following OVA challenge. These data correlate and reinforce the significant role of IL-17 in T-bet−/− animals. IL-17 production is increased in the lungs of T-bet−/− mice following OVA-induced allergic lung inflammation. A, IL-17 cytokine levels in the lung homogenates of naive and OVA-sensitized and -challenged T-bet+/+ and T-bet−/− mice. Twenty-four hours after a 5-day i.n. OVA challenge, lung tissues were collected from T-bet+/+ and T-bet−/− mice. Following normalization to total lung protein, cytokine levels were measured by ELISA. The data represent means ± SEM; eight mice/group; ∗∗∗, p < 0.001. B, IL-17, RORγt, and RORα transcripts were detected by quantitative RT-PCR 24 h following final OVA challenge. C, Flow cytometric detection of IL-17-producing cells in lung lymphocyte preparations from naive and OVA-sensitized T-bet+/+ and T-bet−/− mice following a 5-day i.n. OVA challenge. The data represent mean percentages of positively stained cells within the lymphocyte gate of six mice/group. D, Expression of IL-23 in the lungs of sensitized mice upon Ag challenge. Lungs were collected from naive and OVA-sensitized mice that were challenged with OVA 24 h earlier, and levels of IL-23 were measured by ELISA. The data represent means ± SEM; eight mice/group; ∗, p < 0.05. To determine the requirement for IL-17 in allergic asthma, IL-17R−/− mice were used. Following OVA challenge, granulocytic pulmonary inflammation was decreased in the peribronchial and perivascular regions of IL-17R−/− lungs compared with IL-17R+/+ lungs (Fig. 4⇓A). Similarly, recruitment of eosinophils as well as neutrophils was decreased in IL-17R−/− mice compared with IL-17R+/+ mice (Fig. 4⇓B). Furthermore, expression of IL-4, IL-5, and IL-13 was reduced in IL-17R−/− vs IL-17R+/+ mice following Ag challenge (Fig. 4⇓C). Levels of IL-17 in IL-17R−/− mice were normal or even somewhat higher than in WT mice. In response to aerosolized Mch, IL-17R−/− mice demonstrated an overall reduction in airway response to Mch compared with WT mice (Fig. 4⇓D). Therefore, signaling through IL-17R is required for the development of Ag-induced allergic asthma. IL-17R signaling is critical for Ag-induced airway inflammation. A, Representative H&E-stained lung tissues from 5- to 7-wk-old naive and OVA-challenged BALB/c IL-17R−/− mice (×200; four mice/group). B, Numbers of total cells, eosinophils, and neutrophils in BAL fluids were evaluated 24 h after OVA instillation. BAL cells were stained with Wright’s modified stain and counted according to standard morphological criteria. The data represent means ± SEM; four mice/group. C, Cytokine levels in lungs following allergic lung inflammation induction. Twenty-four hours after a 5-day i.n. OVA challenge, lung tissues were collected from naive and OVA-challenged IL-17R−/− mice. IL-5, IL-4, and IL-13 cytokine levels were measured by CBA; IL-17 levels were measured by ELISA. The data represent means ± SEM; four mice/group. D, Mch dose-response curves 24 h following 5-day i.n. OVA challenge. The data are represented as means ± SEM; six mice/group; ∗, p < 0.05. To confirm these findings and to determine whether IL-17 is necessary for mediating airway inflammation in T-bet−/− mice, pulmonary IL-17 activity was neutralized by in vivo rat anti-IL-17 mAb treatment during OVA challenge. Protein levels of IL-17 in T-bet−/− mice were significantly decreased following Ab treatment, demonstrating that the procedure was effective. 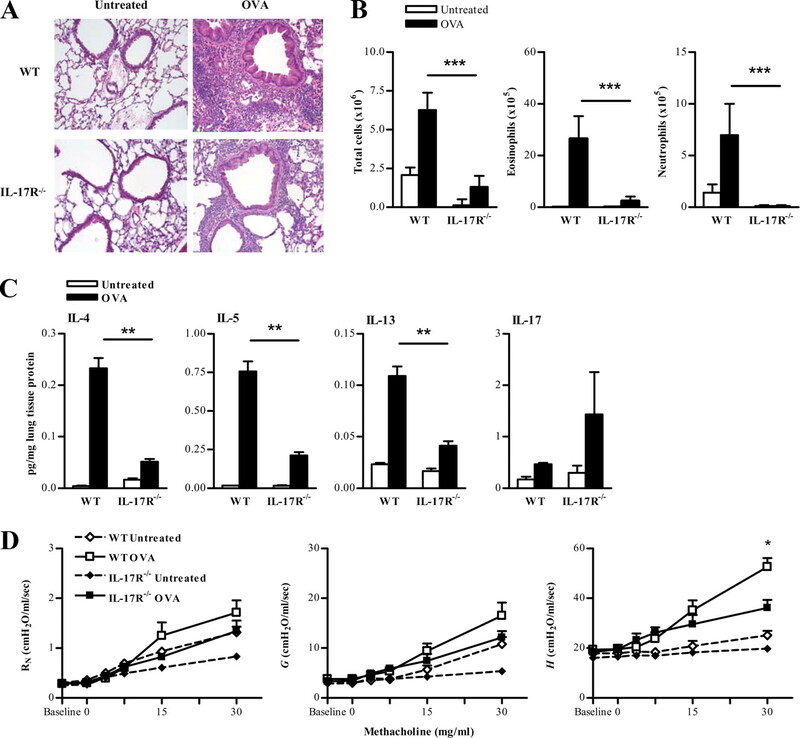 Anti-IL-17 treatment essentially reversed the perivascular and peribronchial inflammation observed in control rat IgG-treated T-bet−/− mice (Fig. 5⇓, A and B). This reduction in inflammation correlated with reduced neutrophilic infiltration (Fig. 5⇓C). However, anti-IL-17 Ab treatment had little effect on the levels of lung Th2 cytokine production (Fig. 5⇓D). It also appears the anti-IL-17 Ab treatment had little effect on airway resistance and tissue damping, but did have a significant effect on tissue elastance in T-bet−/− mice (Fig. 5⇓E), suggesting a specific role for IL-17-induced inflammation in the peripheral airways. IL-17 mediates allergen-induced airway inflammation in T-bet−/− mice. A, Representative H&E-stained lung sections from naive and OVA-challenged BALB/c T-bet−/− mice (×200; four mice/group). Neutralizing anti-IL-17 mAb (α-IL-17) and isotype control mAb (IgG) were administered on days 1–3 of the OVA i.n. challenge. B, H&E-stained lung sections were scored for levels of peribronchial inflammation. C, Numbers of total cells, eosinophils, and neutrophils in BAL fluids were evaluated 24 h after OVA challenge. BAL cells were stained with Wright’s modified stain and counted according to standard morphological criteria. The data represent means ± SEM; eight mice/group. D, Cytokine levels in T-bet−/− lungs following induction of allergic lung inflammation and treatment with neutralizing anti-IL-17 mAb. Cytokine levels were measured by CBA (IL-5, IL-4, and IL-13) and by ELISA (IL-17). The data represent means ± SEM; six mice/group; ∗∗, p < 0.01. E, Mch dose-response curves 24 h following 5-day i.n. OVA challenge. The data represent means ± SEM; six mice/group; ∗∗, p < 0.01. We considered the possibility that other members of the IL-17 cytokine family could have the potential to enhance airway inflammation. IL-25 (IL-17E), a Th2 cell-derived cytokine, is structurally related to IL-17 and uses the IL-17R as a receptor component (30). In addition, IL-25 enhances Ag-induced allergic airway inflammation by promoting Th2-type inflammatory responses (31). To determine its potential role, IL-25 was measured in WT, T-bet−/−, and IL-17R−/− OVA-induced and -challenged mice. IL-25 expression in T-bet−/− mice following OVA challenge was somewhat attenuated compared with WT mice (Fig. 6⇓A), confirming that Th2 cells are not as active in T-bet−/− mice at this stage of allergen challenge. However, a significant increase in IL-25 production in IL-17R−/− animals was observed following OVA challenge (Fig. 6⇓A), presumably due to accumulation of the cytokine in the absence of functional signaling. Anti-IL-17A mAb treatment of T-bet−/− mice resulted in levels of IL-25 that were not significantly different from isotype control-treated mice, indicating that IL-17 depletion targeted IL-17A only and not IL-25 (Fig. 6⇓B). IL-25 (IL-17E) production in the lungs of OVA-sensitized and -challenged mice. A, BALB/c WT, T-bet−/−, and IL-17R−/− mice were sensitized with OVA in alum, and 2 wk later were challenged i.n. for 5 consecutive days with OVA. Twenty-four hours after the last OVA inoculation, homogenates were prepared from lung tissue, protein levels were normalized to total lung protein, and IL-25 (IL-17E) was measured by ELISA. The data represent means ± SEM; four mice/group. B, IL-25 production in T-bet−/− mice sensitized and challenged with OVA. Neutralizing anti-IL-17A mAb (α-IL-17) and isotype control mAb (IgG) were administered in conjunction with OVA i.n. challenge. IL-25 (IL-17E) cytokine levels were measured by ELISA 24 h after the final OVA challenge. The data represent means ± SEM; four mice/group. Taken together, these results indicate that IL-17 is the primary mediator of lung inflammation that is observed in the absence of T-bet and, furthermore, that T-bet is essential for the inhibition of Ag-induced Th17 as well as Th2 cytokine production. Finally, neutralization of IL-17 essentially reverses airway inflammation in T-bet−/− mice. The purpose of this study was to investigate the regulatory role of T-bet in allergen-induced asthma because variable expression of T-bet has been identified as a major factor associated with allergic asthma. We demonstrated that airway inflammation is enhanced in T-bet−/− mice following allergen challenge and that this inflammation is mediated by Th17 cells. Allergic inflammation was significantly decreased in T-bet−/− mice following treatment with neutralizing anti-IL-17 mAb, and little disease was observed in IL-17R−/− mice. These results suggest a potential novel avenue for therapeutic intervention of human asthma. 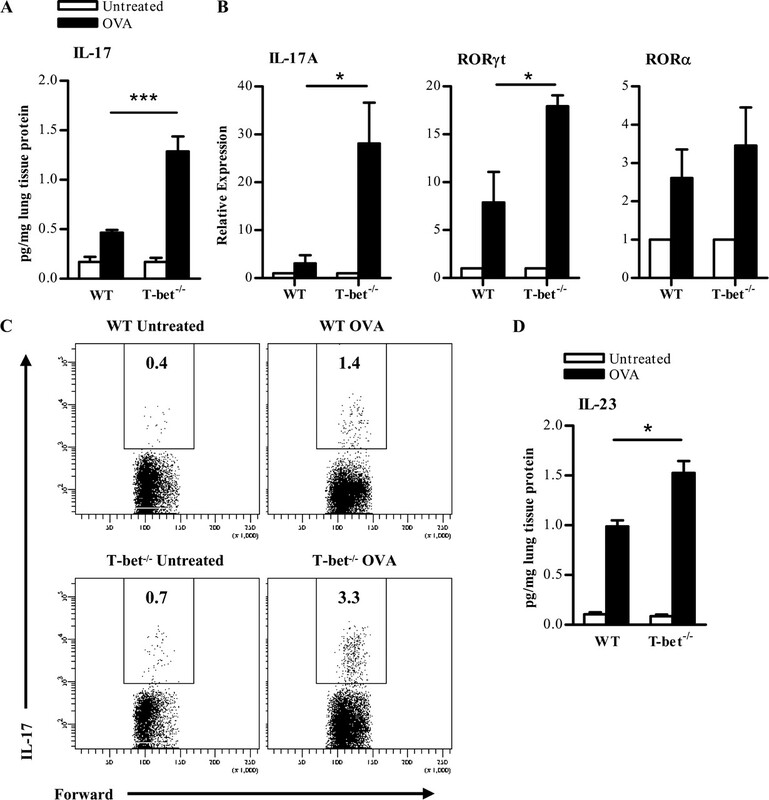 Our results show that T-bet has a crucial role following specific allergen provocation, as demonstrated by an increase in goblet cell hyperplasia and mucus production in T-bet−/− mice challenged with OVA, as well as enhanced granulocytic cellular infiltration into the airways, specifically eosinophils, neutrophils, and lymphocytes, and an increase in bronchial responsiveness. Indeed, these results mirror reports from human asthmatic patients (9, 10, 11). In addition, our results confirm previous observations that BALB/c T-bet−/− mice do not spontaneously develop airway inflammation as compared with C57BL/6 T-bet−/− mice (32). The reasons for this difference may reflect genetic background bias related to the ability to mount Th1- vs Th2-dominant responses (33), or could potentially be due to differences in animal husbandry between different laboratories (34). In any case, the observation of increased airway inflammation following allergen challenge in T-bet−/− mice, as well as the strong correlation between T-bet deficiencies and development of asthma in humans, suggests that dysfunction of T-bet expression may be involved in the pathogenesis of allergic asthma. T-bet is considered to be the master regulator of Th1 differentiation. In addition to inducing IFN-γ production, T-bet also has the ability to suppress Th2 cytokine production (8). 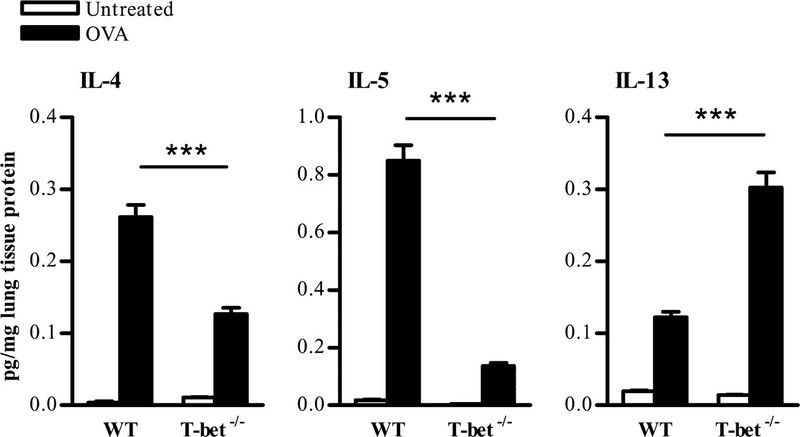 Surprisingly, we did not observe a correlation between Th2 cytokine production and enhanced inflammation in T-bet−/− mice following a 5-day inhalation challenge with OVA. In contrast, IL-4, IL-5, and IL-13 were significantly up-regulated in T-bet+/+ mice following allergen challenge. It has previously been reported that in the absence of T-bet, IL-13 production is enhanced and is responsible for airway remodeling in the asthmatic airway (35). We also saw increases in IL-13 expression in T-bet−/− mice, increases that might have played a role in the increased bronchial hyperresponsiveness and changes in the smooth muscle cells of the airway that were observed. However, the increased infiltration of inflammatory cells into the airways, which most likely was the cause of more severe pulmonary damage, is unlikely to be explained only by the changes in IL-13 production. Thus, our results suggest that BALB/c T-bet−/− mice do not develop enhanced airway inflammation solely through induction of Th2 cytokines. In addition to enhanced eosinophil infiltration, neutrophilic infiltration was also increased in OVA-challenged T-bet−/− mice. Considering that IL-17 can induce neutrophil migration (12) and that IL-17 has been associated with severe asthma pathogenesis (36), we investigated the potential role of IL-17 in the disease phenotype of T-bet−/− animals. IL-17 cytokine levels were up-regulated in both T-bet+/+ and the T-bet−/− lungs after allergen challenge, and lymphocytes obtained from the lungs of these mice also demonstrated increased IL-17 production. Surprisingly, however, IL-17 expression was significantly more pronounced in T-bet−/− vs T-bet+/+ mice. The majority of the IL-17-expressing cells were CD3+. In addition to the increased presence of CD4+IL-17+ lymphocytes, there was a partial contribution of IL-17 production among the CD4−CD8− population, suggesting that in addition to Th17 cells, NKT cells may also play a role, as recently reported (37). Our data parallel previous results by McKinley et al. (38) that IL-17-producing cells are potential mediators of airway hyperresponsiveness and inflammation in the lung. These studies also suggested that Th17 cells are steroid resistant. Although it is unknown whether, in the absence of T-bet, Th17 cells are steroid resistant or not, we have demonstrated that Th17 cells are more predominant. Taken together, these data underscore the necessity for better therapeutics. Ultimately, the findings suggest that IL-17 has a crucial role in enhanced airway inflammation in the absence of T-bet regulation. Indeed, following OVA sensitization and challenge, IL-17R−/− mice were found to have an inability to mount an immunological response to allergen compared with IL-17R+/+ mice. Previous studies have similarly shown that IL-17R signaling is crucial for optimal pulmonary defense against Klebsiella pneumoniae infection (27, 39) as well as for asthma development (40). Because our results suggested a pivotal role for IL-17-induced neutrophil recruitment in mediating the enhanced allergic lung inflammation observed in the absence of T-bet expression, we tested whether lung inflammation could be reversed in T-bet−/− mice by pulmonary delivery of anti-IL-17 mAb during allergic challenge. It was found that administration of anti-IL-17 mAb abrogated the influx of neutrophils into the bronchial lining and essentially prevented development of pulmonary inflammation. At the same time, anti-IL-17 mAb treatment had a minor effect on eosinophilic airway infiltration and Th2 cytokine production. These results suggest that in mice lacking T-bet, IL-17 has a predominant effect on inducing recruitment of neutrophils into the airways, and that this then promotes subsequent inflammatory responses. Thus, blocking IL-17 in certain individuals who are prone to asthma development may represent a novel therapeutic approach for prevention of pulmonary inflammation. Our results in mice lacking the IL-17R clearly show that IL-17 is required for the initiation of allergic asthma and confirm previous studies of others (40). 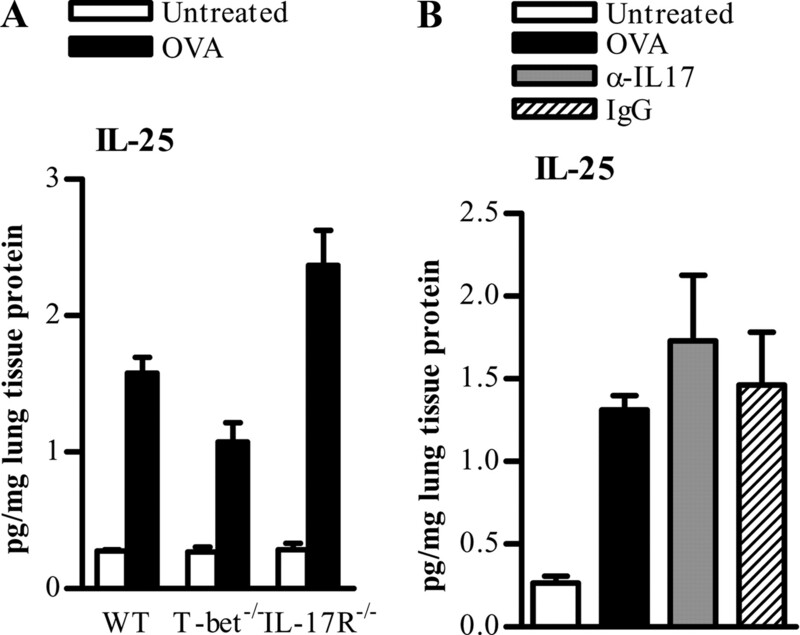 OVA-sensitized and -challenged IL-17R−/− mice exhibited a deficiency in pulmonary cytokine production and airway inflammation compared with OVA-sensitized and -challenged WT animals. Administration of anti-IL-17 mAb to T-bet−/− mice during the challenge phase also had dramatic effects on neutrophil recruitment and on the peripheral airway response to Mch. However, neutralization of IL-17 did not suppress Th2 responses, as was seen in IL-17R−/− animals. The possibility that Th17 cells can convert to Th2 cells following anti-IL-17 mAb treatment cannot be ruled out in our model. However, the Th2 cytokine levels did not appear to be restored to WT levels following OVA challenge (compare Figs. 2⇑ and 5⇑). It is interesting to note that the levels of IL-25 (IL-17E) were elevated in IL-17R−/− mice. IL-25 is known to enhance Th2 responses, and because it signals through a receptor complex consisting of the IL-17RB subunit (41), it would lose this capability in the absence of IL-17R. Thus, whereas signaling by IL-17 and IL-25 would be lost in IL-17R−/− mice, IL-25 would still be functionally active in anti-IL-17-treated animals. This may explain the differential effects on Th2 cytokine expression observed in IL-17R−/− mice compared with mice treated with neutralizing anti-IL-17A mAb. Indeed, our data suggest that neutralizing IL-17 would be beneficial in reducing allergic asthma; however, Schnyder-Candrian et al. (40) demonstrated that eosinophilic asthma was exacerbated by neutralizing IL-17A. The model used was a Th2 cell-mediated and eosinophil-dominant murine asthma model. Our results suggest that in the absence of T-bet, asthma is mediated by IL-17 and that this production of IL-17 is more potent than Th2 cytokine production (see Fig. 2⇑). These data demonstrate the effector role of IL-17 in regulating neutrophilic as well as eosinophilic infiltration and subsequent inflammation. Blocking the effector role of IL-17 in the early stages alleviates allergic lung inflammation. Considering that asthmatic patients demonstrate decreased levels of T-bet expression (9), our model becomes relevant to human asthmatics. In addition to IL-17, IL-6 may also be a potential upstream target for alleviation of allergic lung inflammation. IL-6 is known to be necessary for Th17 cell differentiation, and there is an increase of Th17 cells in our model. In contrast, there is no apparent role for CD8 T cells in this model. Ultimately, these results further highlight the role of IL-17 in mediating enhancement of allergen-induced airway inflammation during the challenge phase of experimental allergic asthma in the absence of T-bet. IL-17 has been shown to be produced in the airways in an allergic lung inflammation model and to be necessary for neutrophilic recruitment (14). Our results confirm these results and, furthermore, clearly define the role of IL-17 in the increased severity of inflammation that is observed in the absence of T-bet. The importance of T-bet in allergic asthma is underscored by recent studies from asthmatic patients, who, as a group, have decreased T-bet expression (10, 11). Previously, it was shown that production of IL-17 can occur in T-bet−/− mice (42). Our study is now the first to demonstrate that neutralization of IL-17 during allergen challenge in the absence of T-bet regulation strongly inhibits airway inflammation. Thus, T-bet in wild-type animals appears to potently inhibit not only Th2 cell-mediated pulmonary inflammation, but also IL-17-mediated neutrophilic inflammation. In fact, our results demonstrate that the enhanced airway inflammation following allergen challenge in the absence of T-bet is dependent upon IL-17 function. These findings suggest that therapeutic strategies aimed at reducing IL-17 production will be useful for suppressing allergic inflammatory responses and other pulmonary disorders characterized by inappropriate T cell activation. Targeting both Th2 cytokines as well as IL-17 may ultimately lead to a more effective therapeutic intervention. We thank the Immunology Core of the Center for Immunology and Microbial Disease for histology services and flow cytometry. We also thank Amgen for IL-17R−/− mice and neutralizing IL-17 mAb. ↵1 This work was supported by National Institutes of Health Grants R01 AI41715 (to D.W.M.) and R01 AR054389 and DE018822 (to S.L.G.). ↵3 Abbreviations used in this paper: WT, wild type; BAL, bronchoalveolar lavage; CBA, cytometric bead array; Ct, cycle threshold; i.n., intranasal; Mch, methacholine; ROR, retinoic acid-related orphan receptor. Eapen, S. S., W. W. Busse. 2002. Asthma. Clin. Allergy Immunol. 16: 325-353. Herrick, C. A., K. Bottomly. 2003. To respond or not to respond: T cells in allergic asthma. Nat. Rev. Immunol. 3: 405-412. Wills-Karp, M.. 1999. Immunologic basis of antigen-induced airway hyperresponsiveness. Annu. Rev. Immunol. 17: 255-281. Cohn, L., J. A. Elias, G. L. Chupp. 2004. Asthma: mechanisms of disease persistence and progression. Annu. Rev. Immunol. 22: 789-815. Iwamoto, I., K. Kumano, M. Kasai, K. Kurasawa, A. Nakao. 1996. Interleukin-12 prevents antigen-induced eosinophil recruitment into mouse airways. Am. J. Respir. Crit. Care Med. 154: 1257-1260. Gavett, S. H., D. J. O'Hearn, X. Li, S. K. Huang, F. D. Finkelman, M. Wills-Karp. 1995. Interleukin 12 inhibits antigen-induced airway hyperresponsiveness, inflammation, and Th2 cytokine expression in mice. J. Exp. Med. 182: 1527-1536. Finotto, S., M. F. Neurath, J. N. Glickman, S. Qin, H. A. Lehr, F. H. Green, K. Ackerman, K. Haley, P. R. Galle, S. J. Szabo, et al 2002. Development of spontaneous airway changes consistent with human asthma in mice lacking T-bet. Science 295: 336-338. Raby, B. A., E. S. Hwang, K. Van Steen, K. Tantisira, S. Peng, A. Litonjua, R. Lazarus, C. Giallourakis, J. D. Rioux, D. Sparrow, et al 2006. T-bet polymorphisms are associated with asthma and airway hyperresponsiveness. Am. J. Respir. Crit. Care Med. 173: 64-70. Munthe-Kaas, M. C., K. H. Carlsen, G. Haland, C. S. Devulapalli, K. Gervin, T. Egeland, K. L. Carlsen, D. Undlien. 2008. T cell-specific T-box transcription factor haplotype is associated with allergic asthma in children. J. Allergy Clin. Immunol. 121: 51-56. Kawaguchi, M., L. F. Onuchic, X. D. Li, D. M. Essayan, J. Schroeder, H. Q. Xiao, M. C. Liu, G. Krishnaswamy, G. Germino, S. K. Huang. 2001. Identification of a novel cytokine, ML-1, and its expression in subjects with asthma. J. Immunol. 167: 4430-4435. Hellings, P. W., A. Kasran, Z. Liu, P. Vandekerckhove, A. Wuyts, L. Overbergh, C. Mathieu, J. L. Ceuppens. 2003. Interleukin-17 orchestrates the granulocyte influx into airways after allergen inhalation in a mouse model of allergic asthma. Am. J. Respir. Cell Mol. Biol. 28: 42-50. Shen, F., M. W. Zhao, B. He, Y. Z. Wang, W. Z. Yao. 2004. [The levels and clinical implications of induced sputum interleukin-17 in chronic obstructive pulmonary disease and asthma.]. Zhonghua Nei Ke Za Zhi 43: 888-890. Barczyk, A., W. Pierzchala, E. Sozanska. 2003. Interleukin-17 in sputum correlates with airway hyperresponsiveness to methacholine. Respir. Med. 97: 726-733. Nakae, S., Y. Komiyama, A. Nambu, K. Sudo, M. Iwase, I. Homma, K. Sekikawa, M. Asano, Y. Iwakura. 2002. Antigen-specific T cell sensitization is impaired in IL-17-deficient mice, causing suppression of allergic cellular and humoral responses. Immunity 17: 375-387. Mathur, A. N., H. C. Chang, D. G. Zisoulis, R. Kapur, M. L. Belladonna, G. S. Kansas, M. H. Kaplan. 2006. T-bet is a critical determinant in the instability of the IL-17-secreting T-helper phenotype. Blood 108: 1595-1601. Alouani, S., P. Juillard, Y. Chvatchko. 2000. Murine model of allergic lung inflammation. Methods Mol. Biol. 138: 285-293. Doherty, T. A., P. Soroosh, D. H. Broide, M. Croft. 2009. CD4+ cells are required for chronic eosinophilic lung inflammation but not airway remodeling. Am. J. Physiol. 296: L229-L235. Hantos, Z., B. Daroczy, B. Suki, S. Nagy, J. J. Fredberg. 1992. Input impedance and peripheral inhomogeneity of dog lungs. J. Appl. Physiol. 72: 168-178. Bates, J. H., S. S. Wagers, R. J. Norton, L. M. Rinaldi, C. G. Irvin. 2006. Exaggerated airway narrowing in mice treated with intratracheal cationic protein. J. Appl. Physiol. 100: 500-506. Fort, M. M., J. Cheung, D. Yen, J. Li, S. M. Zurawski, S. Lo, S. Menon, T. Clifford, B. Hunte, R. Lesley, et al 2001. IL-25 induces IL-4, IL-5, and IL-13 and Th2-associated pathologies in vivo. Immunity 15: 985-995. Fujiwara, M., K. Hirose, S. Kagami, H. Takatori, H. Wakashin, T. Tamachi, N. Watanabe, Y. Saito, I. Iwamoto, H. Nakajima. 2007. T-bet inhibits both TH2 cell-mediated eosinophil recruitment and TH17 cell-mediated neutrophil recruitment into the airways. J. Allergy Clin. Immunol. 119: 662-670. Reiner, S. L., R. M. Locksley. 1995. The regulation of immunity to Leishmania major. Annu. Rev. Immunol. 13: 151-177. Finotto, S., M. Hausding, A. Doganci, J. H. Maxeiner, H. A. Lehr, C. Luft, P. R. Galle, L. H. Glimcher. 2005. Asthmatic changes in mice lacking T-bet are mediated by IL-13. Int. Immunol. 17: 993-1007. Molet, S. M., Q. A. Hamid, D. L. Hamilos. 2003. IL-11 and IL-17 expression in nasal polyps: relationship to collagen deposition and suppression by intranasal fluticasone propionate. Laryngoscope 113: 1803-1812. Kim, H. Y., M. Pichavant, P. Matangkasombut, Y. I. Koh, P. B. Savage, R. H. DeKruyff, D. T. Umetsu. 2009. The development of airway hyperreactivity in T-bet-deficient mice requires CD1d-restricted NKT cells. J. Immunol. 182: 3252-3261. Ye, P., P. B. Garvey, P. Zhang, S. Nelson, G. Bagby, W. R. Summer, P. Schwarzenberger, J. E. Shellito, J. K. Kolls. 2001. Interleukin-17 and lung host defense against Klebsiella pneumoniae infection. Am. J. Respir. Cell Mol. Biol. 25: 335-340. Schnyder-Candrian, S., D. Togbe, I. Couillin, I. Mercier, F. Brombacher, V. Quesniaux, F. Fossiez, B. Ryffel, B. Schnyder. 2006. Interleukin-17 is a negative regulator of established allergic asthma. J. Exp. Med. 203: 2715-2725. Rickel, E. A., L. A. Siegel, B. R. Yoon, J. B. Rottman, D. G. Kugler, D. A. Swart, P. M. Anders, J. E. Tocker, M. R. Comeau, A. L. Budelsky. 2008. Identification of functional roles for both IL-17RB and IL-17RA in mediating IL-25-induced activities. J. Immunol. 181: 4299-4310. Furuta, S., S. Kagami, T. Tamachi, K. Ikeda, M. Fujiwara, A. Suto, K. Hirose, N. Watanabe, Y. Saito, I. Iwamoto, H. Nakajima. 2008. Overlapping and distinct roles of STAT4 and T-bet in the regulation of T cell differentiation and allergic airway inflammation. J. Immunol. 180: 6656-6662.